Wed, Sep 5, 2018, 11:01 pm SL Time, ColomboPage News Desk, Sri Lanka. Sept 05, Colombo: The Office on Missing Persons (OMP) handed its interim report containing interim recommendations to the President Maithripala Sirisena and the Prime Minister Ranil Wickremesinghe at the Parliament today. 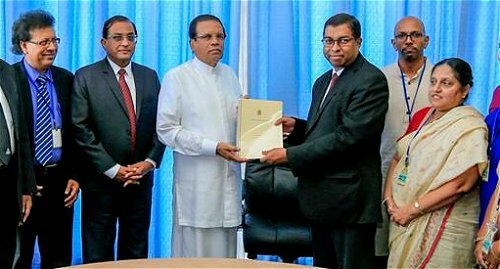 The Chairman of the Office on Missing Persons President's Counsel Saliya Peiris handed over the report to the President. The interim report has been prepared following the investigations carried out for six and it contains recommendations for interim relief as well as securing truth, justice and memorialization. The Office on Missing Persons has officially 'commenced duties following the appointment of the Chairperson and members by President Maithripala Sirisena on 28th February 2018.